Most spiked piercings carry the spike on the place where the ball used to be. Not this helix piercing though. 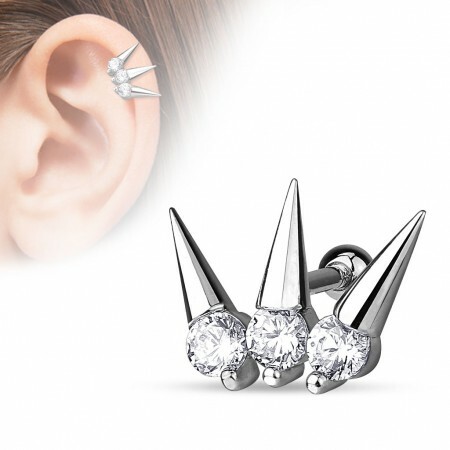 This helix piercing holds a stunning display of three relatively long spikes (0.8 centimeters, crystal included) which each start with a sparkly crystal. The shiny steel in combination with the shine of the stones creates a very striking and unique end result. Cool thing about this helix piercing is that you can wear it in all directions which each create their own look. You can wear it as depicted on the image with the spikes pointing out, but that could be any direction. No matter the place where you are going to wear it or its angle, it will create a unique and striking look each and every time.